This is the ongoing story of El Carrito, a mobile public participation cart that unfolds to reveal maps, models and drawing materials so that local people can describe what they want from their physical environment. Officially introducing the public space trading cards. On Thursday afternoon, we officially launched the Public Space Trading Cards. 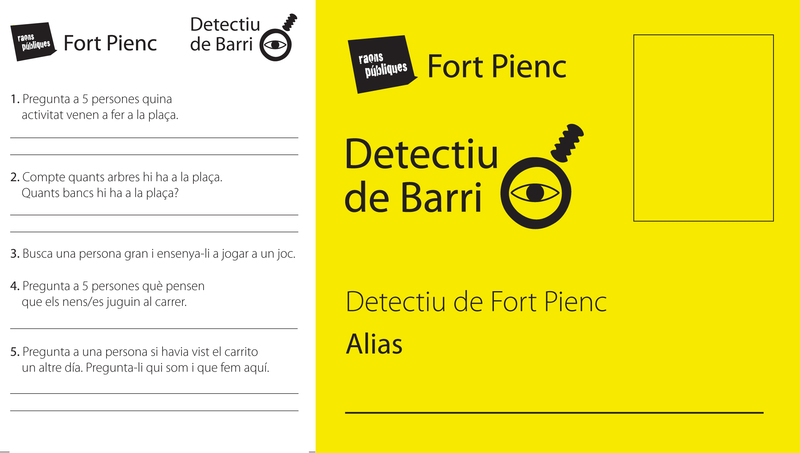 (click here to view PDF of all) Inspired by the game of Detectiu de Barri (Neighborhood Detectives), which challenges children to an urban mission, we wanted to offer a prize after each participant or group answered the 5 Urban Mission Questions. Detective tags and trading cards. 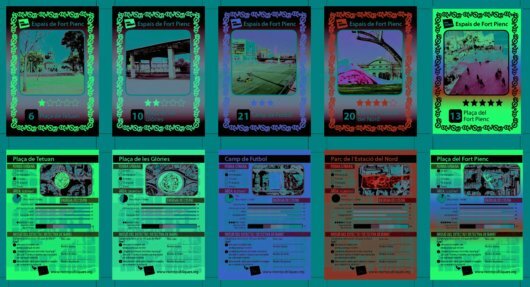 Public space trading card samples. In fact, we met with a school officially to ask his opinion, and it struck me as funny that he remarked on the strangeness of giving away the cards for free. Of course, they are not quite free. They must be earned with some urban exploration, and not the dominant currency. We had some enthusiastic participants. However, before we knew it, the time came for the second activity of the day. The Civic Center Fort Pienc hosts various dance classes, including American country dancing. 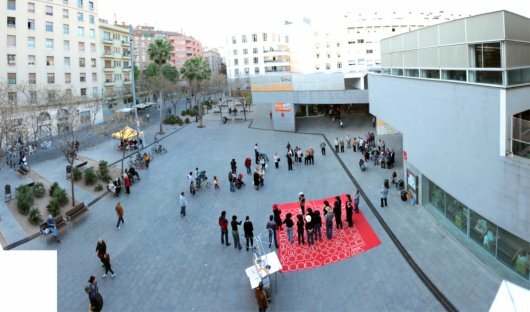 In our continued efforts to get to know the neighborhood better, we saw this as a great opportunity to use activities already occurring in Fort Pienc and infuse them with an urban twist. And so, rolling out the red carpet complete with a neighborhood map, El Carrito to the side and some Raons members joining and participating in the festivities, the country dancers of Fort Pienc draw quite a crowd. Country dancers, neighborhood-map red carpet and El Carrito. A variety of people participate, and the observers create a circle around the dancers. Country dance participants and observers. It is also a great opportunity for some Raons Publiques members to walk around and informally talk to the observers and ask them what other types of activities they would like to see in their neighborhood. Their dancing looks quite beautiful from above! Country dance circle in Fort Pienc. Of course, despite the music and the general focus on the dancing, it is good to remember that not everyone will use the space in the same way. 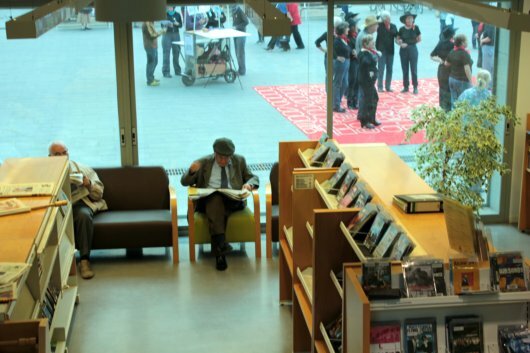 As I went to the library terrace to take photos, I noticed that the first floor of the library was full as usual, mostly with senior men, newspapers in hand. You can see the country dancers through the window, just outside the reading room.